We think it's safe to call Jason Statham a quattroholic. The Transporter star and voice of 'Truth in 24' has been seen driving various four-ringed rides for years now - both on and off the screen. 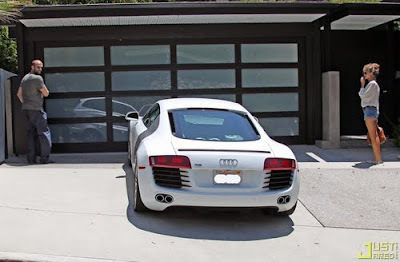 It's no surprise then that the paparazzi catch Mr. Statham and girlfriend (Transformers 3 Megan Fox replacement) Rosie Huntington-Whiteley at Statham's Hollywood Hills pad alongside his new, white Audi R8.